By LUDWIG VON KOOPA - Just how much do you truly value your network of people? How do you connect this to games? 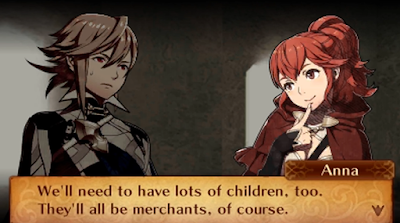 That's the whole philosophy of the Support mechanic in the Fire Emblem franchise! Supports have evolved over time and are appealing to the fans for a variety of reasons, which I'll cover in this article. 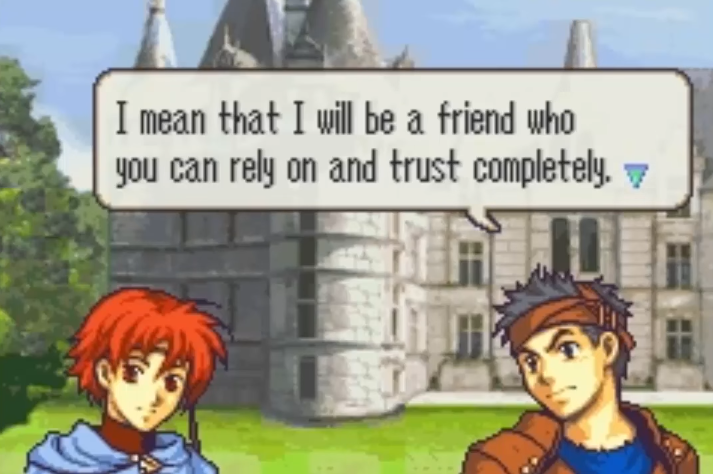 How well does each Fire Emblem Support structure hew to the friends-not-networks philosophy? Fire Emblem: The Binding Blade, released in Japan in 2002 (that's the one with Roy in it) introduced the Support system to the series. Previous games sometimes dabbled in Support-esque interactions, but this game was the first where your characters could further platonic relationships. For Fire Emblem: The Binding Blade, Fire Emblem: The Blazing Blade, Fire Emblem: The Sacred Stones, and Fire Emblem: Path of Radiance (finally breaking the “the” trend in the titles), characters could have a maximum of five Supports. A Support with an individual character could be a C, B, or A-level Support, and each level counted against one of those five Supports. So you could have five C-level Supports with five different characters (or the equivalent of networking) or an A-level support and a B-level Support (making deep friendships). This is Ewan (left) and Ross (right) having their A-level Support conversation. Ross wants to be Ewan's best friend for life! Versus the C-level conversation where they said hi. Supports, from a character development perspective, generate a substantial conversation between the two characters that go into their back-stories. As you get a higher Support level, the characters have a bigger relationship with one another and trust each other more, sharing more about their lives and helping them develop as people. People who are deeply attached to the characters have replayed the games over and over again to see all of the Support conversations — since you can only get five conversations per playthrough per character (without killing anyone off). Your average character might have 4–6 characters they can support, which is 12–18 conversations. From a gameplay point of view, Supports give bonuses when Supporting characters are next to one another. What kind of bonus is dependent on a character's elemental affinity (every character belongs to an affinity and certain affinities boost different things; some are more useful than others). Gameplay-oriented min-maxers will prioritise character relationships just based on affinity. But the gameplay-mechanics-obsessed players are failing the Noonan principle. (Reminder that Peggy Noonan is the woman with the Wall Street Journal column.) They're forcing characters to make relationships not for the humanity of it, but just for stat boosts. To get ahead in the cutthroat world and try to get personal opportunity. Not because they actually care about anyone involved. You see those scare quotes in the heading? Yeah, Fire Emblem: Radiant Dawn ruined Support conversations. That's one of the legitimate gripes you can have with the game, much more legitimate than the professional reviewers’ complaints that Fire Emblem: Radiant Dawn didn't have Mii Support. Leonardo: Hey, Edward... I hope you're doing all right over there! Edward: Hi there! It's good to see you're still fighting. That's the entire conversation. They aren't real conversations. It's people talking past one another. Unit 1 says their generic thing. Unit 2 says their generic thing. They would say the same thing no matter who they're talking to (for the majority of cases—a few characters get slightly more unique ones but nothing of that much notability). That does nothing for gamers playing for story & characters (though Fire Emblem: Radiant Dawn has a lot of content there outside of Supports to sink your teeth into). It exclusively is a gameplay mechanic, with the aforementioned elemental affinities still playing a role. You'll start and end relationships on a moment's notice, severing ties between characters. 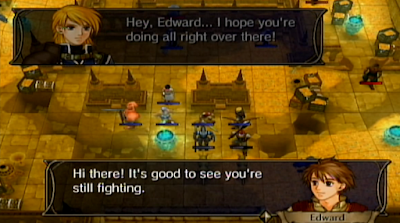 Suddenly, three in-game years after Fire Emblem: Path of Radiance refined the Support system from the Game Boy Advance games to have the best system in the franchise, the people of Tellius completely forgot what it means to be social. You might say having one really great friend is all you need, but not when your conversations are trite. That is the very essence of “networking” and not making friends. In fact, there are slight variations that most characters have in their speech patterns when addressing a royal character. So instead of, “Edward, you mean a lot to me!” you get “King Naesala, you mean a lot to me!” The character's name being Naesala, and the King being a custom-added title. You know that's not making friends. That's just title-based flattery—the equivalent of having a drink of your choice at a drink-providing establishment of your choice with an “influencer” in whatever field you want to be in and getting their business card. “Well I know Dave... he's a venture capitalist. Yup, I got connections.” Then you call Dave when you have a new business idea and try to guilt him into hearing what you have to say because you bought him that drink years ago without talking to him since. Anything is better than what Fire Emblem: Radiant Dawn did with supports (other than not having them at all: see Fire Emblem: Shadow Dragon), which brings us to Fire Emblem Awakening and the three Fire Emblem Fates games on the 3DS that have dominated the direction of the franchise since 2012. Fire Emblem Awakening and the Fates games now allow for you to support every character a unit can support in one playthrough, and the number of characters that are compatible for unique support conversations has ballooned due to the marriage mechanic. While a unit can only marry one character (the new “S-level” Support—only available in hetereosexual relationships except for a couple of instances in Fates) per playthrough, you can A-level with everyone if you put the time into it. That's right, no limitations. And a lot more people to support. Fire Emblem: Radiant Dawn could've and should've put that amount of effort, but I'm not here to keep complaining about that. How would Peggy Noonan see this? Well... I think she'd see it as a straight improvement of the early 2000s. You can now handle having multiple best friends and deep relationships, even entering marriage and establishing a family. And these aren't Millennials waiting forever to start a family. They're getting on with it! These young adults already have a plan! One of her concerns is the lack of real social skills in the kids going to college. Certainly, the units in the latest Fire Emblem games are doing a lot better than the socially-challenged units of Fire Emblem: Radiant Dawn. That's something to be proud of. Why, there are very real relationships here... and that's clear whether you're playing the Japanese versions or the American ones. Did Ludwig just end up writing an article that concludes in a large compliment to the Fire Emblem games he says ruined the franchise forever for him, with a diss to his second-favourite Fire Emblem game? Well, on this one particular topic, that's the correct analysis to take. He still praised Path of Radiance, at least. What do you think? About anything. Networking vs. making friends. Or how the support system has evolved over the series. Advance Wars fans may be triggered by this whole topic since the lack of a Support system is why that series is discontinued. Hey, remember that thing you wanted to know about me but I said you hadn't "tripped enough relationship meter flags" for me to tell you? Well this makes for an even better analogy. For me to share THAT, you'd need to have an A-Level Support with me, and at this point we're definitely just C-Level. 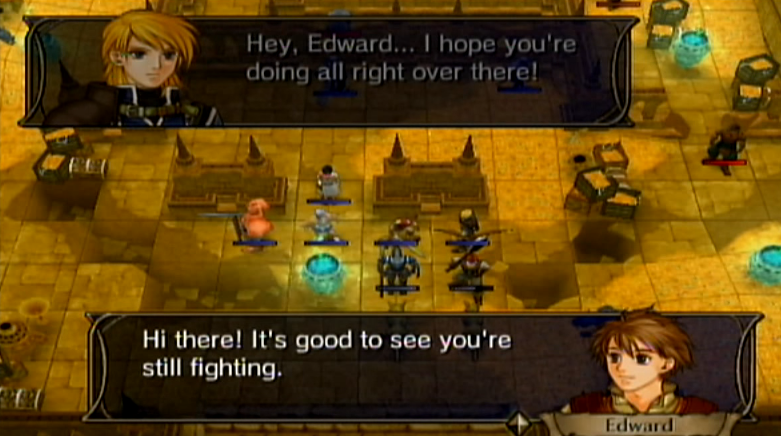 Well, depending on the game, you either gain support points (what lets you move up in Support levels) by standing next to the character for dozens of turns, just being deployed in the same mission as them (Path of Radiance), or doing a lot of Pair-Ups with them. We should be getting closer to a B-level! I'd say we're reasonably close to a B-level, yes, what with how many back-and-forths we've had here. The next time you write about something that hits home for me on a lot of levels is likely when you'll find out. It's just something I feel will happen sooner or later. I got hired at my current employment without anyone knowing me at all. Was about to be thrown out due to my poor behavior but managed to convince them to keep me in and now I have still been employed without needing to network for it. Or maybe I had a network with my then unborn daughter who saved my job so who knows? Have you made friendships at your employment?